While that was still been viewed, the photo shoot I planned and directed back in October was featured ahead of time on the fantastic Love My Dress blog!! I was so honoured that Annabel featured the shoot as it was a standing point in my career; not only was it my first shoot, I wanted to create inspiration for gay couples and people looking for autonomy and tweedy creations (not going to give too much away). Of course I’ll be featuring this shoot in the next few weeks and focusing on each supplier involved as each went above and beyond in supporting me with this shoot. So sty tuned for sure! To view the shoot, just click on the image below. I’m sure you’ll love it and get loads of inspiration. The blog is going to be very busy in the next few weeks with both of my recent features, hope you’re just as excited as I am? Thanks for popping by and thank you to Annabel and Lou for featuring me on there blogs :-). 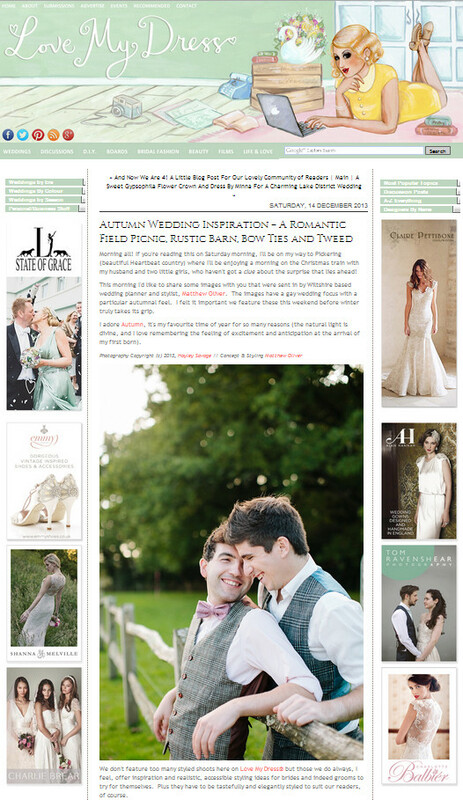 « Featured on the Amazing and Beautiful Whimsical Wonderland Weddings Blog! !